You've started babysitting and decided you love it, now what? Grow your babysitting business with a little hard work, a lot of networking, and some creative marketing tools. Before you know it, you'll be booked every weekend! Your first babysitting job will probably be watching your own siblings or other kids you already know. But, advertising in your neighborhood or community is an excellent way to get more babysitting jobs. Many community centers have programs for children, which parents bring them to during the week and weekend. Bring along your flyers and ask if you can make a quick announcement of your services at classes. Think outside the box and find ways to show parents on the spot how great a babysitter you are. Run a promotion and offer to occupy kids for the rest of the class after your announcement or bring printable activities and crayons for the kids to use while you're talking. If the center hosts classes that highlight your hobbies or skills, offer to volunteer. The more you spread the word about your availability for babysitting the more likely you will get a job. Even if you don't get a job through the people you talk to, one of those people may tell someone else who is looking. Even though you're a teen, you still have a professional network you can tap into. Have your relatives promote your services by telling their friends about you. Ask your parents and older siblings to promote your business at their place of work. Let teachers and school staff members know you are looking for babysitting work. If you have friends with younger siblings (and your friend doesn't like babysitting), let their parents know you're interested. Many villages, towns, and cities have free newspapers and allow free ads. Look at local businesses to see what newspapers or periodicals are available. Check the pages or online for contact information. You can also use some of your babysitting profits to pay for an ad. Newspapers ads are often small and don't include colors or graphics unless you pay for them. Get creative with your wording to make it sound fun, but make sure you include the important information parents will need to get in touch with you. Volunteering is a great way to meet parents who already know you and trust you. Home daycare centers, big childcare centers, and after-school programs often utilize volunteers to keep costs low and programming high. Have a resume ready to hand out at local childcare programs and schedule in-person meetings with directors when possible. Many parents go back to school in the summer and will need someone to care for their children during the day. Check the school's bulletin boards in the main building on campus or post one of your flyers. Colleges often have an employment department where students can go to look for job opportunities or services available. If you want to meet parents in need of your services, you'll need to go where they are. Check with fitness centers, grocery stores, and mom groups to see if you can post a flyer or work with them to provide childcare services. Think about places where parents might have trouble keeping kids entertained and head there first. Schools and other non-profit organizations often keep lists of certified babysitters on file after a babysitting course is offered in the area. Make sure your name gets on that list so parents who call there will find your name. If no one in your area keeps a list like this, ask if you can help them start one. You wouldn't think about searching online for a babysitting job but it's a great way to find people looking for childcare. Many people will post their need for childcare online or will search for caregivers. Some newspapers print their classifieds on the Internet. Check the classifieds of your local newspapers online to see if anyone is looking or take out an advertisement. Free websites like Craigslist have different sections for each city. You can also check standard job sites such as Indeed or Snagajob. Check to see if anyone has posted a childcare need in a city near you or post your services. Childcare is a major occupation these days, so there are websites dedicated to helping people find caregivers of all kinds in their area. Make a professional profile for yourself and see who's looking for help near you. One of the best-known sites for sitters is Care.com. Their Basic Profile for caregivers is free and gets your information out there, but you'll need the paid membership to apply for jobs listed on the site. Sitter.com also has a free Basic Profile option and several paid member options to help families find you or you find new clients. Use a free app like Sittercity to get instant access to local babysitting jobs. Have you found that sometimes you get an interview with a parent but you end up not getting the job? Parents want to protect their children and want to make sure you will protect them when you are caring for them. 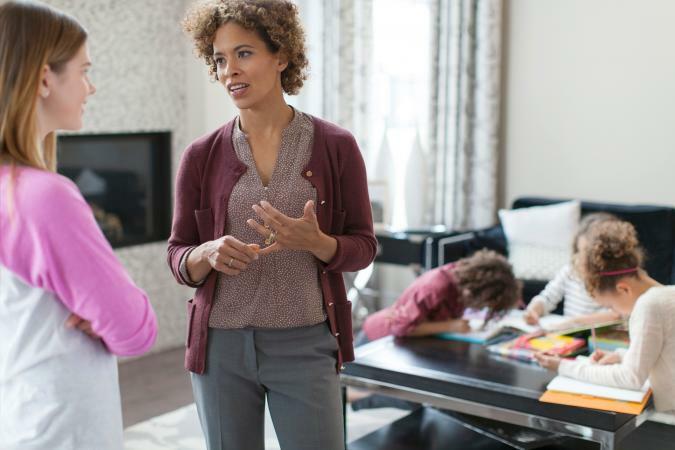 Look for ways to show your maturity, responsibility, and child care skills that will make parents feel confident you are the right person for the job. Look for a First Aid/CPR class where you can get certified. You an also take a babysitter course to receive specialized training in caring for kids of all ages. Take as many classes in school and online as you can in areas like child development or SIDS to enhance your knowledge base. Keep copies of your certifications on hand and be sure to mention them when talking with potential clients. Look for unique ways to share your business other than hanging flyers or telling people you babysit. Create a meme about your babysitting services and send it to people you know. Get yourself featured in an article in the local newspaper. Set up a kids' table and share your information at the local farmer's market. It may seem like a bad idea, but joining forces with your competition can actually help you both get more jobs. You can form a group like the Babysitter's Club from the classic book series of the same name and work together as a babysitting business. Another option is to find one other babysitter in the area and team up with her to recommend each other when you get a job offer you can't take. Finding jobs is easy, doing a great job is more difficult, and leaving a lasting impression is the hardest part of babysitting. Show off your professional side by sending thank you notes to clients after every babysitting job. Let them know how much you love working with their family and they'll love you even more. Always be careful when you meet new parents especially if you don't meet them through a relative, friend, or neighbor. Bring a trusted adult along whenever meeting new clients. If you ever feel uncomfortable with a situation or by what a parent has said to you, tell someone right away. Babysitting jobs are fun, but you need to protect yourself.